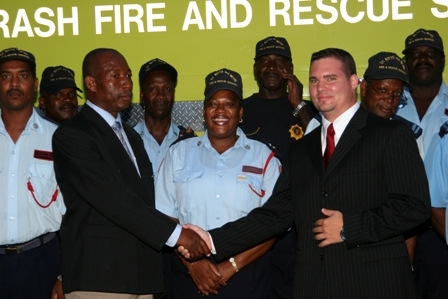 Head of the St. Kitts and Nevis Fire and Rescue Services Mr. Hester Rawlins assured his men stationed on Nevis that the shortage of manpower would be addressed before year end. 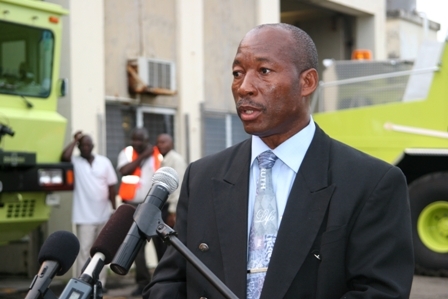 He made the disclosure at a recent ceremony held by the Nevis Air and Sea Ports Authority (NASPA) to commission a new EC$1.5million dollar fire tender at the airport in Newcastle on Nevis. “I want to give my ministry’s commitment that the manpower problem on Nevis will be improved later this year when our basic training course is completed,” he said. Notwithstanding, Mr. Rawlins appealed to the young persons on Nevis to join the security services because their services were needed now more than ever as partnership and collaboration was embraced to make the communities safe. He also addressed the issue of training which he said was critical to the Fire fighting service and urged the authorities to treat it with some degree of seriousness. “Preventative maintenance is critical to the life of this crash tender. I urge the authorities to treat this as a matter with some degree of seriousness. The Fire Services will continue to give support in this area. Let us recognise the impact that security and safety plays in the economic development of our Federation,” he said. The Head of the Federation’s Fire Services pointed to training that his men had received earlier this year when four officers had successfully completed Aircraft Rescue Fire Fighting training in Toronto Canada and one was stationed in Nevis. Mr. Rawlings applauded the Nevis Island Administration for its decision to purchase a fire tender and described it as a correct decision. “There are times decisions are made that are not popular even though they are correct. To the Honourable Premier and cabinet, your decision to purchase a Crash tender was absolutely correct and you deserve a round of applause,” he said. He further indicated that when he met earlier in the year with the Manager of Customer Services of Argo American Inc. Mr. Stephan Williams, the company which supplied the equipment, he did not have the slightest idea that a new crash tender would be handed over at the airport in Nevis before the 25th anniversary of Independence. “When the senior fire officers and myself met with Premier Parry and other government officials earlier this year, I left the meeting very confident that things will be different thereafter. Three thousand gallons more of water and other media means we have far exceeded our capacity to meet International Civil Aviation Organisation (ICAO) and Federal Aviation Administration (FAA) standards to which all of us should be proud,” he said.